Finding remnants from the bygone days of Vegas is always a treat. I’ve been scouring the mezzanines, peering under tarps and poking a camera through keyholes to add to my Hidden Vegas series. In the previous installment, I even flew overhead to photograph massive construction projects that are hidden from the average tourist’s point of view. Recently I looked to the skies once more…from the inside of Miracle Mile Shops of Planet Hollywood. And there I found remains of the formerly Arabian-themed Desert Passage Shops. I started coming to Las Vegas in 2005, and had only been through the Aladdin Resort once or twice. At that time, the Planet Hollywood restaurant chain was in deep trouble, with closures taking place around the country. The announcement that Aladdin would be re-branded as Planet Hollywood Hotel Casino seemed very foolhardy. Sure, the movement to de-theme Strip resorts was in full swing, and Middle-eastern-flavored places like Aladdin and Sahara had fallen out of fashion in a post-9/11 world. But Planet Hollywood??? That decision seemed as out-of-touch as renaming it after dying restaurant chains like Chi-Chi’s or Kenny Roger’s Roasters. Shows how much I knew, as Planet Hollywood Hotel is now a hip, popular middle-tier destination, with stars like Jennifer Lopez and Gwen Stefani on the marquee. Somehow their biggest draw was Britney Spears, proving that there’s still plenty of dried-up cheese on the Planet Hollywood menu. Until very recently, the south-facing exterior of the mall along Harmon Avenue still carried the Aladdin facade. The removal of Krave nightclub and eventual opening of Buffalo Wild Wings and another Nacho Daddy finally jump-started the finishing of that section. It’s uncertain if the remaining Arabic interior will eventually get stripped out and de-themed. But for the time being, it’s another chapter in my book of Vegas curiosities. This article previously appeared on another site. It has been revised with updated information. Images: Sammasseur with additional stills from Miracle Mile Shops via Facebork, wishuwerehere.com and Greg C.
I do a fly-over of the Valley to reveal more unusual structures…. I’ve had a great time bringing you our series of “Hidden Vegas” oddities…things that are sometimes right under your nose. Like the abandoned Rocket Ship Ride at Circus Circus. A cleverly-hidden unfinished St. Regis Tower at Venetian. The massive phallic erection inside Shops at Crystals. Today’s entries aren’t on the Strip, but if you’ve flown into the city a few times, you’ve no doubt seen one or more. First up is Ascaya, a failed luxury housing project. This massive abandoned development in the Henderson area is etched into the side of the McCullough mountain range. It’s easy to spot from the sky, southeast of the Strip and not far (when viewing from a plane seat, that is) from the M Resort. The Ascaya project was intended to provide 331 lots for high-end mansions. It was shut down and barricaded in 2009, after more than $200 million was spent on blasting into the mountainside to construct housing pads and connecting roadways. I recall shooting some pics up there in the foothills near that development back in 2009. I biked up there a number of times from the Anthem housing area where my parents used to live. Got a rude shock one day when an accidental blasting charge went off in open air as they were working in another zone near that area. I was actually facing in that direction and could see the distortion of the shock wave hit me about a half-mile away. The shock wave shattered windows in nearby completed homes. I have been to eleven hotel implosions and this shock wave exceeded anything I ever felt at those….. I dug up one pic from 2009 showing my bike out there in the foothills behind that area…..you can see the Strip in the distance… Used to go up there all the time…..
“You can also see where some of the work was going on cutting into the hills.” Greg C.
“You can see the Ascaya terraces here from behind. The city is beyond the ridge”. According to VegasInc, the site was re-opened in August of 2014 to sell off parcels of land in phases. The article also described plans for a clubhouse to lure prospective builders, with an intended summer 2015 start date. I can see no evidence of it in my aerial photos taken in July 2016 . The official Ascaya website had you believing that everything in the project is going according to plans of its creator, Hong Kong billionaire Henry Cheng. Panoramic motion photography sweeps over the gigantic corpse layout and invites you to envision the gorgeous community that awaits. Good luck with that…even the site itself appears to be dead these days, although a dedicated Facebook page is (somewhat) alive. Only time will tell if the Ascaya Luxury Community ever lives up to the promises of its designers. Until then, much like the Fontainebleau behemoth on the north Strip, Ascaya will be a shrine…and a testament….to over-reaching ambition. Once your eyes have finished taking in the Ascaya debacle, allow them to drift in a southeasterly direction. There you should be able to spot another massive project, albeit a very successful one. The Nevada Solar One plant lies in the Eldorado Valley, south of the region between Las Vegas and Boulder City. If you’ve ever taken a day trip to Laughlin, you’re sure to have seen this massive solar power plant. After all, it covers 400 acres of prime sun-fed Nevada desert. Nevada Solar One took sixteen months to construct and went online in June of 2007. Unlike the Ascaya project, which literally blew away fifteen million cubic yards of mountain rock, the Solar One plant’s 760 parabolic trough concentrators follow the natural terrain of the desert floor. The silent and somewhat aesthetic complex generates about 136 million kilowatt-hours annually. And according to Wikipedia, the amount of carbon emissions it reduces by creating clean energy is the equivalent of removing 20,000 automobiles from the road each year. A different kind of power plant…hydro-electric…is just a short drive from Nevada Solar One. Of course, I’m talking about Hoover Dam. This man-made wonder continues to generate enormous amounts of electricity for Arizona, California, and Nevada. That’s despite the fact that continually-dropping water levels have dramatically changed the appearance of Lake Mead. Man-made Lake Mead has shrunken in both depth and width, with shorelines crawling far inward throughout the past several years. The entire Lake Mead Marina had to be relocated in 2008 as water disappeared. It was floated two miles downstream to join Las Vegas Marina. This was a huge effort that moved hundreds of boats, slips, a restaurant, and store at the pace of 1 mph. Lake Mead Marina was only one of several dock and marina relocations required due to the drop in depth. Flying overhead, you can clearly see what remains of this dwindling body of water…and where the shoreline once was. It’s a sad, extreme example of the impact of climate change. Just a little farther north of Lake Mead, you may spot another debacle to rival Ascaya. But at least this one actually was completed before falling apart. Lake Las Vegas Resort is a never-was destination of hotels, residences, golf courses, shops, restaurants and a casino. The centerpiece of this resort community is a 320-acre artificial lake that was built atop the Las Vegas Wash. The wash feeds contaminated…and radioactive…run-off from the Vegas valley into Lake Mead (keep that in mind if you’re ever planning a boating or swimming excursion there). Filling of the new lake began in 1990, and over 3,500 acres of land surrounding it were made available for retail and housing development. Since then, Lake Las Vegas Resort has had a depressing history of closures, lawsuits, and massive debt. Hotels have been closed, re-opened by other owners and then closed again. Empty storefronts spread out across the retail “Village” area and abandoned golf courses eventually turned from green to brown (they have recently sprung back). 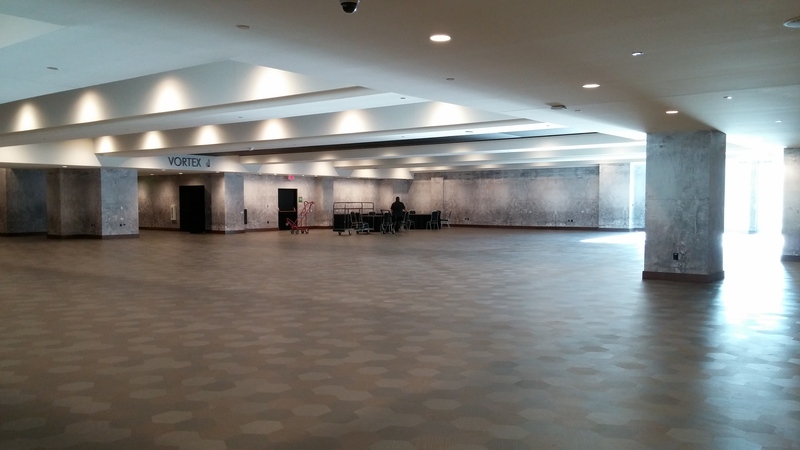 The Monte Lago Casino ceased operations twice before being relaunched as a barely-used events center. Lake Las Vegas Resort, surrounded by unfinished construction projects. As with Ascaya, the official Lake Las Vegas website is full of gorgeous photos depicting a successful and glamorous destination. But one look from above will tell you that it’s anything but. This article previously appeared on another site. It has been updated and expanded. Photos: Sammasseur (aerial), Greg C.
If you’re a frequent traveler to Las Vegas, you might think that you know the city pretty well. It is, after all, one of the most visitor-friendly cities in the world. And yet, there’s a separate side to Vegas that you may not ever see. It’s vast, exists on many levels, and some of them are right under your nose (like the never-completed St. Regis Tower at Venetian, hidden behind a canvas facade). My fascination with this city’s secrets was ignited back in 2007 when I lost some memory cards in front of the Mirage volcano. Hours later I was escorted to the casino’s Lost and Found department to claim them. Luckily, that office was deep within the bowels of the Mirage. The stroll back there seemed to take forever, and I was amazed at the enormous amount of activity that most folks would never lay their eyes on. It was like stumbling upon a forgotten city…dazzling and unforgettable. The Strip isn’t the only place where you can go treasure hunting. Downtown Las Vegas is a veritable goldmine for the urban explorer. There are catacombs inside just about every hotel on Fremont Street, especially at places like Binions and the now-destroyed Las Vegas Club, where closed-off hotel rooms and shuttered restaurants are just begging to be rediscovered. While we don’t encourage doing anything illegal, it’s hard to resist the urge to peer behind a rarely-open door, especially when you have a camera or phone with you. My buddy Scott Roeben, that cool dude at VitalVegas, has become fond of regularly posting his own “security breaches”. Perhaps it’s the reporter in us, ever-present, that hopes to catch a glimpse of the newest venue rising up behind construction barricades. Even so, if you explore, do so wisely and at your own risk. 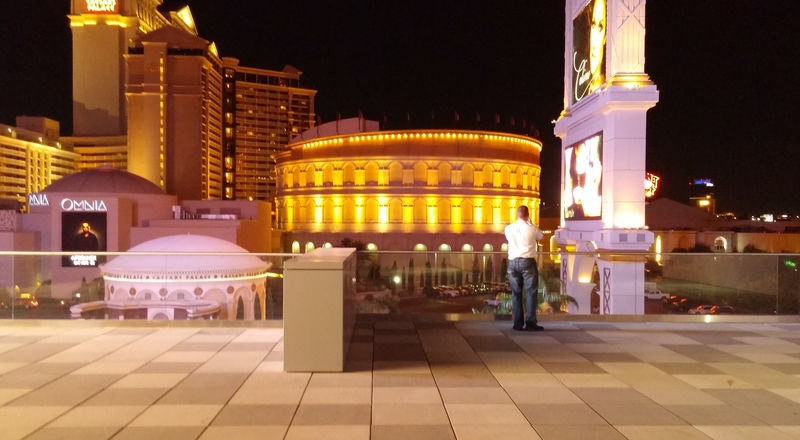 I’m 2015, while searching for a less-crowded restroom at the premiere of Mat Franco – Magic Reinvented Nightly, I headed to the fifth floor of Linq Hotel, which was once a collection of Imperial Palace restaurants. These days it has been named the “Bloq Room” and was a temporary home to Divas Las Vegas as their theater was undergoing renovations. 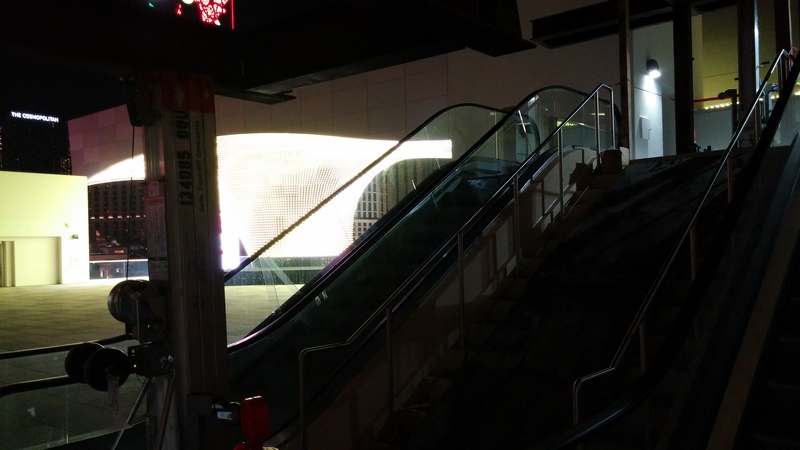 On the far side of Bloq Room, a pair of open doors beckoned me towards a not-quite-finished escalator that led towards a vast outdoor space. And beyond that was…(cue the drum roll)…THE VORTEX!!!! The Vortex might seem eerily familiar to Star Trek fans. Perhaps that’s due to its resemblance to the God-like artificial intelligence known as V’Ger from the 1979 theatrical movie STAR TREK: The Motion Picture. 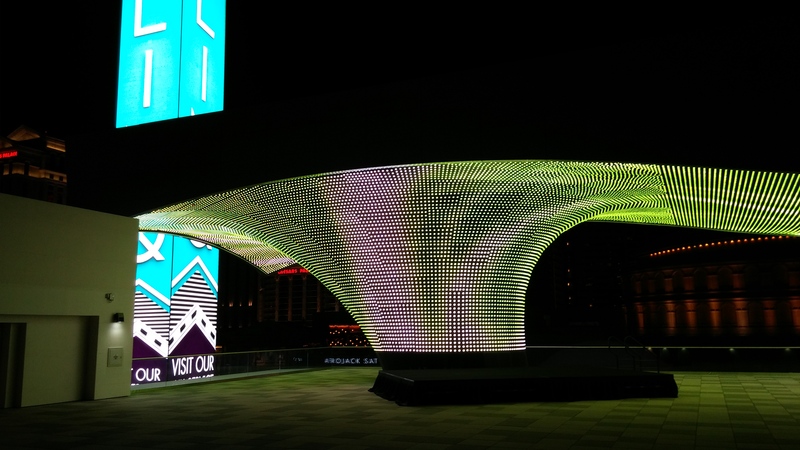 You have no doubt noticed this incredible light show, which beckons visitors away from the Strip and into the pedestrian mall that now shares the Linq name with the former Quad Hotel. 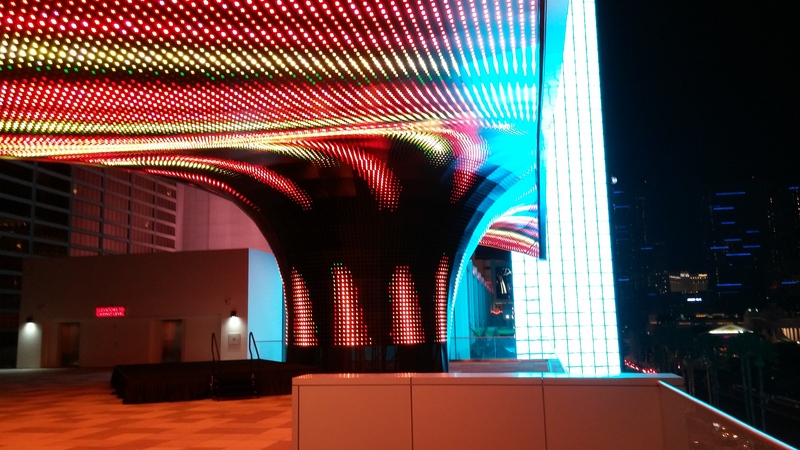 The colorful swirl of lights is an eye-catcher from the ground, but standing underneath it is absolutely surreal. The dizzying, ever-changing digital tornado could easily give you a feeling of vertigo, especially if you’re prone to motion sickness. Epileptics, don’t even think about prowling around up here. But what exactly is this space and why isn’t it being utilized? 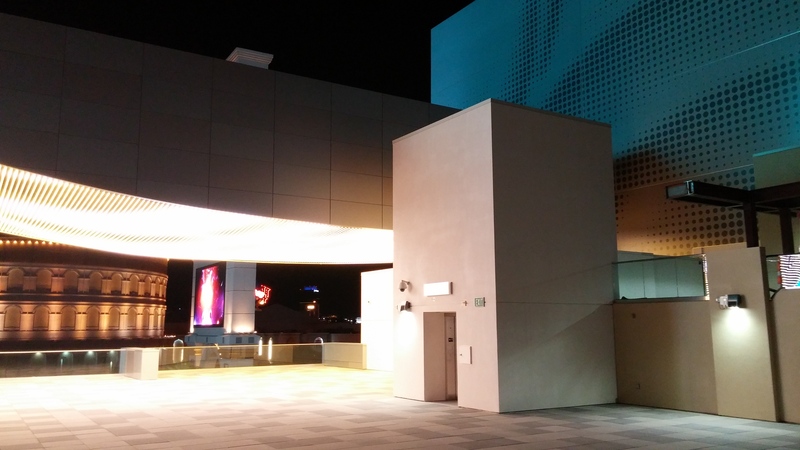 Ask the show performers and employees at Linq, and the most common response is “I heard it’s going to be a nightclub”. So why isn’t it yet? Pure Nightclub at Caesars Palace became Omnia in less time that Vortexhas been sitting here, virtually forgotten. 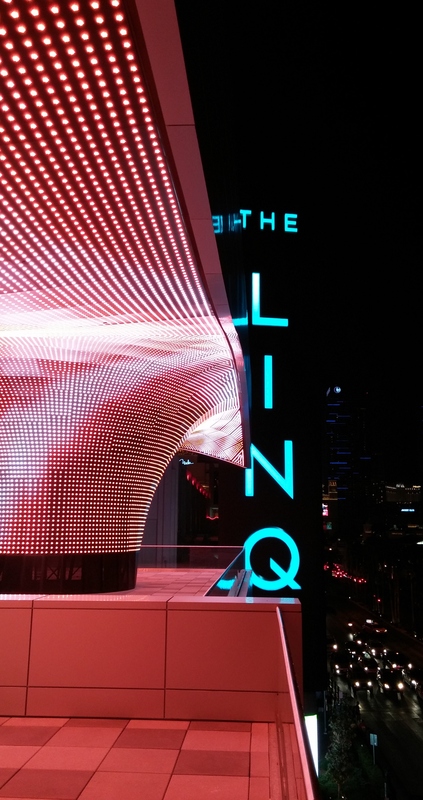 Press releases stated that the renovation of Linq Theater was the final step in Linq Hotel‘s conversion. 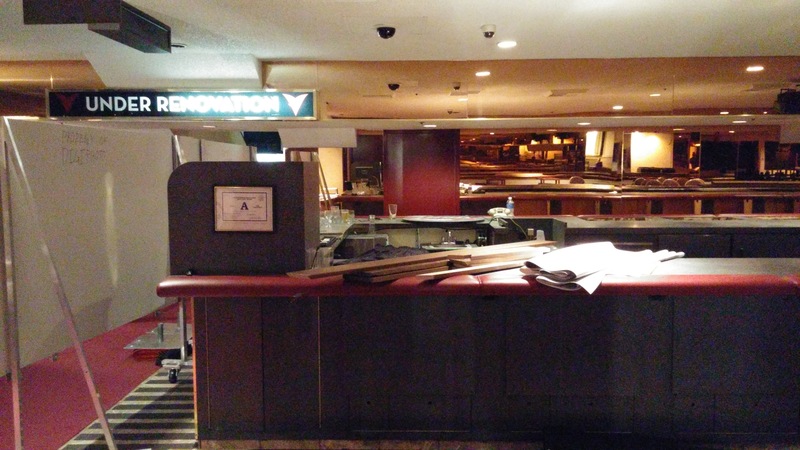 But I wasn’t so sure of that, as my explorations also came across the former third-floor bar/food court/sportsbook, walled off and awaiting renovations. 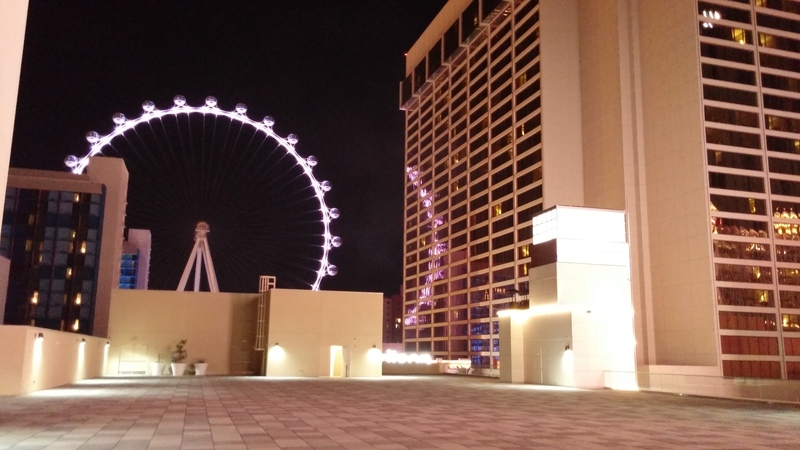 I do know that the Vortex Deck has been used for special events, as a Fourth of July fireworks viewing party was held there that summer for Linq VIP customers. And, we spotted a small stage during our exploration that appeared to have been recently used. 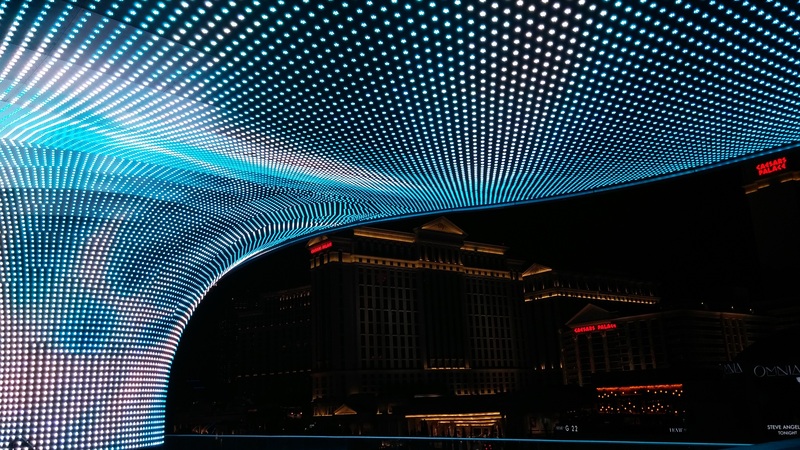 According to the Vortex information page on Caesars Entertainment website, this massive space and light show can be yours…for a price. The entire deck is available for parties, catered events, concerts, weddings etc. Prices aren’t mentioned anywhere, but we guess it would cost a pretty penny to have such a sprawling venue – with an incredible view – all to yourselves. For us that evening, the space, the solitude, the silence…and the view…were absolutely free. And totally priceless. But with the recent announcement of both a zip line and the bizzare Kind Heaven project, the future of this spot seems uncertain. So, the next time you’re in Sin City, consider putting on your hiking shoes and setting out to find your own “Hidden Vegas”. But be sure to share those photos!